I am delighted to announce that the Yoga Brunch Club retreat will be returning to Oxfordshire at the stunning Poundon House. In November, you are invited to join me at the luxurious privately owned country house: Poundon House. A stunning family run country home, surrounded by 6 acres of beautiful countryside. It is the perfect opportunity to reset and intentionally carve out sometime for yourself as we approach the end of the year. After the sell-out success of my first retreat, I am beyond excited to be hosting this weekend again, spanning three days and two nights we will enjoy daily yoga classes from both me (Clem Balfour ) and guest teacher Cloudia Hill. As Yoga Brunch Club’s mission is about making yoga more accessible to all, this is very much a retreat open to all levels. If you have just taken a couple of classes and have always wanted to go on a retreat but never made the leap, or you have been practicing yoga for years, this is the perfect time to join me for a weekend of relaxation, time to unwind, learn something new, eat delicious nourishing food, chat and meet new people. As the food is as key to the weekend as the yoga, I am thrilled to have Kimberly Parsons joining us for the weekend. Kim is a chef and author of 'The Yoga Kitchen' and recently published ‘The Yoga Kitchen Plan’. Kimberly's passion for food comes from her Sicilian family roots and culminated in her opening a chain of London health cafe's in 2013 called 'Retreat' cafe. Kimberly spends her time cooking on health retreats all over the world and resides in the English countryside where she cooks bespoke healthy meals for many celebrity and private clients delivering them to doorsteps all over London. There will be plenty of opportunities for long walks, cups of tea by the fire for a natter or curled up with a good book, and most importantly to treat yourself to sometime away in the middle of winter. Come alone or with a friend to enjoy the company and comfort of being a part of this small and intimate gathering. Hosted in the peaceful surroundings of Poundon House for a weekend of yoga, relaxation and nourishing food. There will be daily yoga practices (5 in total) led by Clem Balfour and Cloudia Hill. Saturday and Sunday will open with a two hour morning yoga class that will begin gently, progressing into a more dynamic flow, invigorating and waking up the body, focusing and calming the mind. There will be an inversion workshop, so you can have the time to learn how to get in and fall out of poses and have fun with it. Gentler evening Yoga will explore asanas and breathing techniques, working with yin yoga and more restorative self practice, helping to refine awareness and prepare you for a good nights sleep. The weekend will build from one day to the next, enabling the group to make progress in their practice with a toolbox of skills that they can take back home with them. If you have been to a Yoga Brunch Club before you will know that the food is just as important as the yoga and we take pride in the food that is provided. Kimberly Parsons is the author of ‘The Yoga Kitchen’, and recently published ‘The Yoga Kitchen Plan’, a speaker, lecturer, professionally qualified naturopath, chef and entrepreneur. As ‘The Yoga Chef’ her mission is to teach people how to tune-in to their innate wisdom and learn how to listen to their body’s daily signs and symptoms in order to find long lasting, vibrant health and happiness. She calls this ‘body intelligence’ and is deeply passionate about helping people tap into this knowledge to find true connection. Kimberly's passion for food comes from her Sicilian family roots and culminated in her opening a chain of London health cafe's in 2013 called 'Retreat' cafe. Kimberly spends her time cooking on health retreats all over the world and resides in the English countryside where she cooks bespoke healthy meals for many celebrity and private clients delivering them to doorsteps all over London. The stay includes 2 hearty suppers, a wholesome lunch and 2 nourishing brunches, plus plenty of snacks, tea, coffee and the best goddamn homemade tahini cookies you will ever taste. Please let us know if you have any specific dietary requirements or allergies when booking so that we can take these into consideration when planning the menus. Please do bring along plenty of warm layers and comfy clothes to practice yoga in, I recommend packing a shawl and some cosy jumpers so you can really feel at home. All yoga equipment, mats, props and blankets will be provided but if you would prefer to bring your own mat please do. See below for details of room types and prices. Poundon House has been the home to the Roscoe family for almost 40 years and is still privately owned and lived in by the family making it full of warmth and life. The house was built in 1908, set within 6 acres of landscaped gardens on the edge of the Oxfordshire/ Buckinghamshire border. Despite the peace and tranquility of surrounding countryside, Poundon is in easy reach of London, Oxford, Milton Keynes, Birmingham, the Cotswolds and Bristol with fantastic transport links to the all of these places. Each room in the house has been carefully redecorated and restored over the last five years, while staying true to the country house-style of the Edwardian era. Kim is a chef and author of 'The Yoga Kitchen' and recently published ‘The Yoga Kitchen Plan’. Kimberly's passion for food comes from her Sicilian family roots and culminated in her opening a chain of London health cafe's in 2013 called 'Retreat' cafe. Kimberly spends her time cooking on health retreats all over the world and resides in the English countryside where she cooks bespoke healthy meals for many celebrity and private clients delivering them to doorsteps all over London. Brought up in a Sicilian/British household in Australia, I was exposed to a strong European influence from an early age. I was lucky enough to grow up in an environment where I searched for freshly laid eggs under the hens’ warm bellies each morning. At age five I could tell you exactly what was growing in the vegetable garden; I knew when the raspberries were ready to be picked for making jam. My Sicilian grandmother had a passion for simple healthy food that tasted great. It was from the bustling warmth of her kitchen that she taught me to create mouth-watering recipes that had remained unchanged through countless generations before her. Over the many years I spent in her company, under her watchful gaze, I came to learn the art of cooking as well as adopting many of her underlying cooking principles. Clem is an adventurous, fun teacher drawing on her experience after finding yoga over a decade ago, to teach uplifting classes. Clem teaches an ever-changing sequence inspired by vinyasa flow (aligning breath and movement), which allows her to respond to the energy in the room. Her classes are often set to a modern playlist, combining elements of Yin and Yang, to help balance out your energy and allow you to experience the effects of Yoga for your body and your mind. Founder of the Yoga Brunch Club, she is on a mission to break down barriers and make yoga more accessible for everyone. The events and retreats are designed to give you the opportunity to pause, breathe, stretch, eat and connect with a new group of people who share similar interests. Combining open level, energising yoga sessions with great food in beautiful surroundings. What more could you want? Cloudia found yoga whilst working as an actress on tour in the US, going onto train as a teacher with Stewart Gilchrist at The Power Yoga Company, 2012. She continues to practice, learn, train and pass on what she has learnt to you, whilst looking after two whippets and occasionally treading the boards on stage & screen. Cloudia’s natural and honest approach allows you to grow both physically and spiritually on and off the mat. 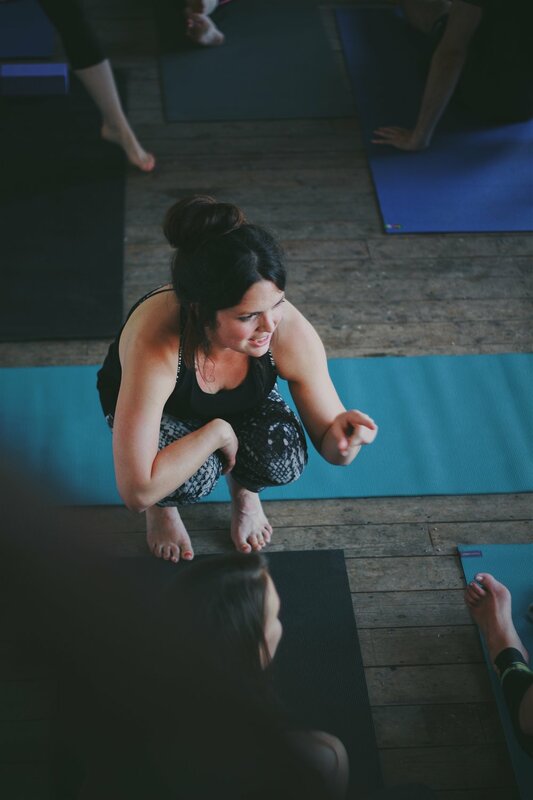 Sweaty Betty Ambassador Cloudia teaches at the Power Yoga Company and various other brilliant studios in London. Early Bird 10% discount available on prices above if retreat package after deposit is paid in full by 1st May 2019. *Please note that all deposits and bookings are non-refundable and non-transferable. Luxurious towels and white dressing gowns are provided for each guest. Poundon House is very easily accessible by car or train.